Size: -- Choose Size -- 2XL/ Fit Natural Waist 34"-35" L/ Fit Natural Waist 30"-31" M/ Fit Natural Waist 28"-29" S/ Fit Natural Waist 26"-27" XL/ Fit Natural Waist 32"-33"
Product prices and availability are accurate as of 2019-04-21 06:10:51 EDT and are subject to change. Any price and availability information displayed on http://www.amazon.com/ at the time of purchase will apply to the purchase of this product. Our high elasticity, moderate control shaperwear can slim your waistline immediately. This tank top slenderizes your waist and flattens your tummy. Super soft and stretchy fabric conforms to the body for a smooth flattering look and suitable for everyday moderate control. And you even don't realize you're wearing shape wear.It is a basic that you'll want to add to your wardrobe. Lightweight and comfortable fabric provides maximum comfort and breathability. Adjustable shoulder straps with strength to hold up. Open bust with push up function allows you to wear your own bra. This torsette provides 360 degree firm control, perfect for a more toned look under clothes. 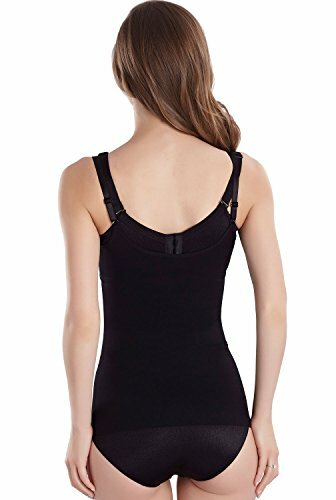 You can get the fit and coverage you want from your bustline with any outfit when wearing this cami shaper top.